The SOMERSET Book Awards recognize emerging talent and outstanding works in the genre of Literary, Contemporary, & Satirical Fiction. The Somerset Book Awards is a genre division of the Chanticleer International Book Awards (The #CIBAs). Chanticleer Book Reviews is looking for the best books featuring contemporary stories, literary themes, adventure, satire, humor, magic realism or women and family themes, we will put them to the test and choose the best among them. Information about the #CIBAs Long Lists and Short Lists and Announcement Rounds. These titles have moved forward in the judging rounds from SLUSH pile to the 2018 Long List (aka the Slush Pile Survivors). These entries are now in competition for the 2018 SOMERSET SHORT LIST. The Short Listers will compete for the Semi-Finalists positions. Semi-Finalists will receive an email confirmation. The coveted First Place Category Winners of the 2018 SOMERSET Book Awards will be selected from the Semi-Finalists in the final rounds of judging. The First Place Category Winners will be announced at the Chanticleer Awards Banquet and Ceremony. The First Place Category winners will automatically be entered into the SOMERSET GRAND PRIZE AWARD competition. The 16 CBR Grand Prize Genre Winners will compete for the CBR Overall Grand Prize for Best Book and its $1,000 purse. First Place Category and Grand Prize Awards will be announced and recognized at the Chanticleer Awards Banquet and Ceremony on Saturday, April 27th, 2019, Bellingham, Washington. These titles are in the running for the SHORT LIST of the 2018 SOMERSET Book Awards novel competition for Literary, Contemporary, and Satirical Fiction. Edwin Newman – Science! On The March! To view the 2017 Somerset Book Award Winners, please click here. The submission deadline for the 2018 Somerset Book Awards was Nov. 30, 2018. 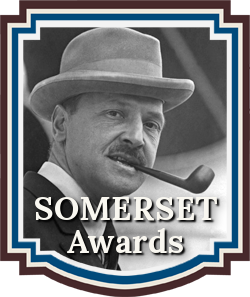 We are now accepting entries to the 2019 Somerset Book Awards. Please click here for more information and to enter.